It tastes best when made with very young spring lamb. 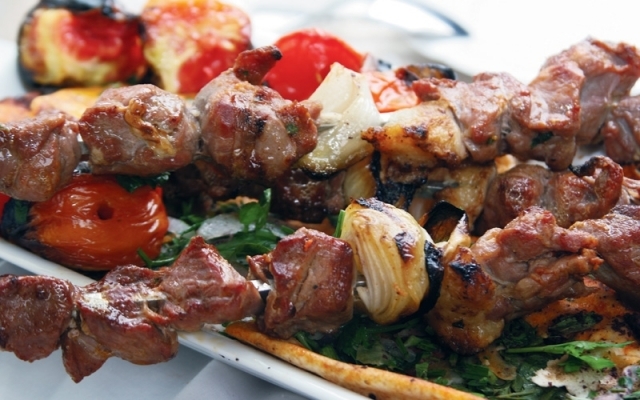 Lebanese cooks broil the skewered meat over charcoal on their braziers called manqals. The juices which drip during the broiling are caught inside a loaf of Arabic bread. When the meat is done, it is slipped off the skewer into the bread. In Turkey the meat is marinated in olive oil before broiling. 1. Chop meat into one-inch cubes. Season with salt and pepper and let stand for an hour. 2. Spear onto skewers, allowing six pieces of meat per person. Alternate lean and fatty meat with onions. Broil under a very hot flame, or over charcoal until outside is well browned and sizzling. If broiled in the oven, sprinkle a little olive oil over meat before broiling so that it will not dry out. Excellent accompaniments to this meat are Hummus with Tahini Paste and Baba Gannouj.